The game was scoreless until the eighth, when the PawSox scored on a sacrifice fly from Jeremy Hazelbaker and an RBI single from Brock Holt. Holt and Xander Bogaerts each had two hits to lead the Pawtucket offense. One day after an exciting win at Fenway, the Sea Dogs nipped the Harrisburg Senators (WAS), 3-2. Terry Doyle tossed five innings, allowing one run on eight hits and three walks, while striking out four. Jeremy Kehrt picked up his first win of the season, pitching two innings of relief and surrendering one run on two hits and two walks. Noe Ramirez picked up his second save. Down 1-0 in the third, Portland grabbed a 2-1 lead on a wild pitch and a Tony Thomas sacrifice fly. After the Senators tied the game in the top of the seventh, the Sea Dogs reclaimed the lead in the bottom half of the inning, getting a lead-off home run from Matt Spring. Portland won the game despite being out-hit 10-5 and going 0 for 6 with runners in scoring position. A six-run eighth inning by Potomac sunk Salem, as it fell to the Nationals (WAS), 6-4. Henry Owens dropped to 7-4, as he twirled 7 2/3 innings, allowing four runs on four hits and three walks, while striking out seven. Matty Ott was charged with a blown save, allowing two runs on two hits and a walk in 1 1/3 innings of relief. Salem took an early 2-0 lead in the first, getting back-to-back RBI singles from Blake Swihart and Mookie Betts. In the fourth, the Red Sox expanded their lead to 3-0 on a solo home run from Matthew Gedman. A three-run bottom of the ninth allowed the Lakewood BlueClaws (PHI) to walk off with a 4-3 victory over Greenville. Cody Kukuk tossed six innings, giving up one run on five hits and two walks, while striking out five. Jack McGeary tossed two scoreless innings of relief, bringing him to nine consecutive scoreless innings as a member of the Drive. Austin Maddox received the loss, allowing three unearned runs on three hits. The Drive took a 1-0 lead in the first on a Tim Roberson solo home run. With the game tied 1-1 in the fourth, Greenville brought home two on a home run by Mario Martinez. Lakewood took advantage of an error in the ninth inning and brought home the winning run on a game-ending RBI triple. The Drive were 0 for 5 with runners in scoring position. In game one of a doubleheader, Lowell fell to the Vermont Lake Monsters (OAK), 6-1. Mario Alcantara picked up the loss, tossing 2 2/3 innings and surrendering six runs (four earned) on six hits and five walks, while striking out two. Dylan Chavez tossed 3 1/3 scoreless innings of relief. The Spinners lone run of the game came in the sixth, as Kevin Mager ripped an RBI double. Game two featured just four hits, with the Spinners clipping the Lake Monsters, 1-0. Francisco Taveras picked up the victory, tossing five innings and allowing a hit and a walk, while punching out five. Carlos Pinales and Kyle Martin each pitched an inning of relief, with Martin picking up his second save. Lowell's lone run of the game came in the second, as the Spinners took advantage of two Vermont errors to bring home the game's only run. 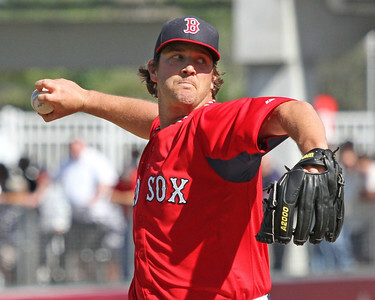 Player of the Day: Steven Wright, who pitched a complete game shutout against Lehigh Valley, allowing just four hits and a walk, while striking out seven. Wright, who will turn 29 late next month, has had a stellar July, going 2-1 with a 2.20 ERA in five starts.